Since the beginning of August, Truex has only collected two top-10 runs. Truex is still sitting pretty in the points. That’s due to a fallback from points gathered earlier in the season. Week after week, he’s been fast. However, Truex has had several on-track incidents that have taken him out of contention for a halfway decent day. Truex was running 2nd at Bristol Motor Speedway back in August. He was clipped in the left rear coming off the corner by Kyle Busch. Truex smacked the wall, several times. His race came to an end. Jimmie Johnson was a more recent driver to do it. He and Truex spun in the final corner of the Roval 400. That would have been the first win since July for Truex. Johnson offered a peace offering via 12 tiny bicycles. It was a prank. But, it was also something else, an apology. Last week, Aric Almirola bounced off the outside wall at Dover International Speedway. That particular track is a self cleaning race track. Almirola collected Truex in the crash. Chuck Lemay was the first person to find the bikes that randomly found a home on the tongue of the #78 trailer. Lemay has been the hauler driver for Furniture Row Racing since the team began at Dover in 2005. For 2019, Furniture Row Racing will close shop. “Now, I gotta go find a real job,” Lemay concluded. Cole Pearn was the one that sparked that prank. He suggested that Jimmie Johnson get mountain bikes for the crew. 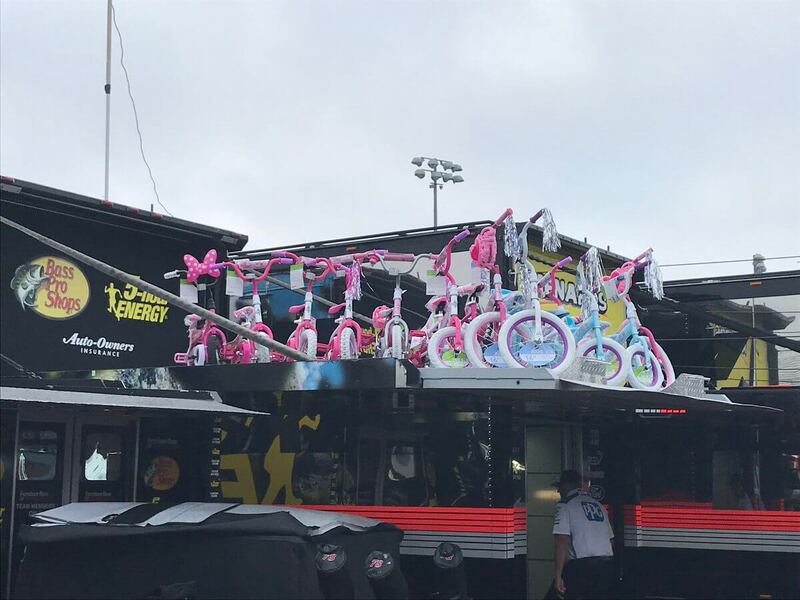 Cole Pearn and Martin Truex Jr signed the first bike that was given away. Johnson wheel hopped into the final corner of the Roval. 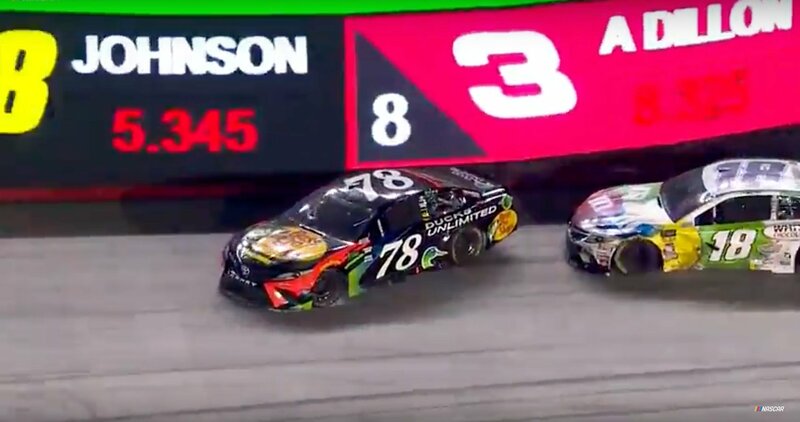 While spinning, he collected Truex and took them both out. The next week, Johnson gifted the team with bikes, just like they asked. “Our guys were giving him a hard time. Asking if maybe he could get them some road bikes. That was his response. Yeah, it was pretty funny this morning,” Martin Truex Jr commented. Truex and Johnson are over their on track incidents. But, Truex is still up to his ears with getting taken out. For the next guy, it might not go so well. “It’s getting time to get in the playoffs. We’re trying to get to Homestead. This is serious business,” Truex continued. “If somebody else does something stupid… I might have to retaliate,” Truex says with a smile and a laugh. 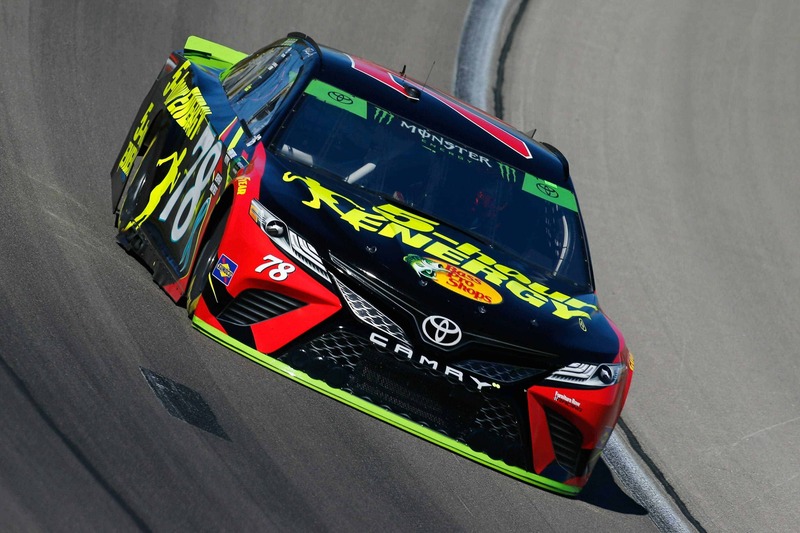 Martin Truex Jr has four wins in the 2018 Monster Energy NASCAR Cup Series team. It’s the final season for his team, the defending series champions. It’s been expected that Truex will head over to Joe Gibbs Racing to drive the #19.